The HP t5545 is part of the HP thin client portfolio designed for mainstream business. The HP t5545 offers convenient access to Windows or Citrix environments, mainframes, mid-range servers, UNIX/Linux hosts, and web applications. The ThinPro operating system, Firefox browser, terminal emulation, dual monitor support, support for the most common connection brokers, and choice of management solutions provide a great user experience and easy management. A single console provides streamlined and customizable user interface. Questions about the HP t5545? We can help. For more information about the HP t5545, or any of our products and services, call us at 1.800.457.8499 or email us. 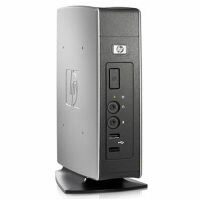 Order your HP t5545 today. Order your HP t5545 now. Your purchase order, with credit approval, is welcome, as well as all major credit cards, PayPal and Google Checkout. Remember, you'll get FREE technical service with every product you buy from Vecmar.